EAGLEVILLE, PA, January 9, 2018 – Streamlight® Inc., a leading provider of high-performance lighting and weapon light/laser sighting devices, announced it has added a new model to its PolyTac® line of tactical lights to include an enhanced, dual fuel version. The new light, the PolyTac® X, features 600 lumens, and offers the versatility of a rechargeable battery option. The light can be powered by either two 3-volt CR123 lithium batteries or one Streamlight rechargeable 18650 lithium ion battery. This multi-battery option allows for use of primary disposable batteries if the rechargeable cell is out of power. 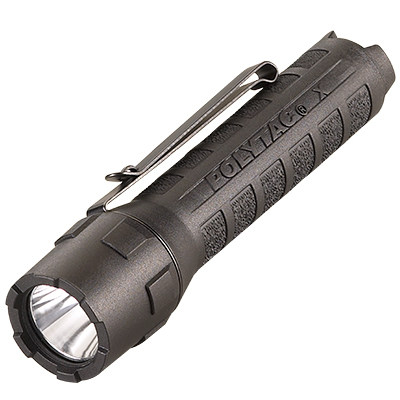 The PolyTac X uses a power LED to provide three lighting modes: high, medium, low, and strobe. Regardless of battery source, the light delivers 600 lumens on high, 11,485 candela, and a 205-meter beam distance, which is enough to provide critical lighting for a range of tactical uses. When using CR123A batteries, run times range from 2.75 to 34 hours; when using the 18650 battery, they range from 3.5 to 36 hours. On the strobe setting, run times are 5.5 hours and 8 hours, respectively. The light’s TEN-TAP® programmable push-button switch allows users to select from three programs: high/strobe/low (factory default); high only or low/medium/high. The PolyTac X is exceptionally durable, featuring a case made of high impact super tough nylon polymer that also provides a sure grip. It weighs 4.34 ounces and measures 5.46 inches. The new light features an IPX7-rated design, providing waterproof operation to 1 meter for 30 minutes, and is impact-resistant tested to 3 meters. It is available in black, yellow, or coyote. Streamlight offers an optional 18650 Battery Charger that can recharge either one or two batteries simultaneously, and permits charging through either AC/DC or USB power sources. The PolyTac X has an MSRP of $75.00. It is packaged with two CR123 batteries and a removable pocket clip and comes with Streamlight’s Limited Lifetime warranty. Based in Eagleville, PA, Streamlight, Inc. has more than 45 years of experience making tough, durable, long-lasting flashlights designed to serve the specialized needs of professionals and consumers alike. Since 1973, the company has designed, manufactured and marketed high-performance flashlights, and today offers a broad array of lights, lanterns, weapon light/laser sighting devices, and scene lighting solutions for professional law enforcement, military, firefighting, industrial, automotive, and outdoor applications. Streamlight is an ISO 9001:2008 certified company. For additional information, please call 800-523-7488, visit streamlight.com or connect with us on facebook.com/streamlight;twitter.com/Streamlight; instagram.com/streamlightinc; and youtube.com/streamlighttv.